From crispy chicken skin to Nashville hot sandwiches, the sheer variety of fried chicken in Chicago is impressive. 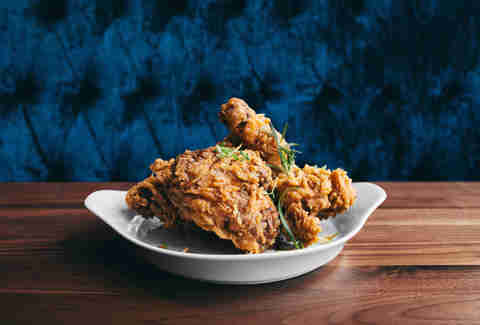 While you may think your best bet for fried chicken is a chicken-focused spot (of which, we have plenty), some of the best birds can be found in other unsuspecting restaurants across the city. From sweet and spicy fried wings, to juicy chicken sandwiches, and cornmeal-dusted chicken breasts, here are eight of the best fried chicken dishes you're overlooking. This Evanston restaurant is the work of Amy Morton (daughter of Chicago restaurant legend, Arnie Morton), and Chef Nicole Pederson (Lula Cafe). 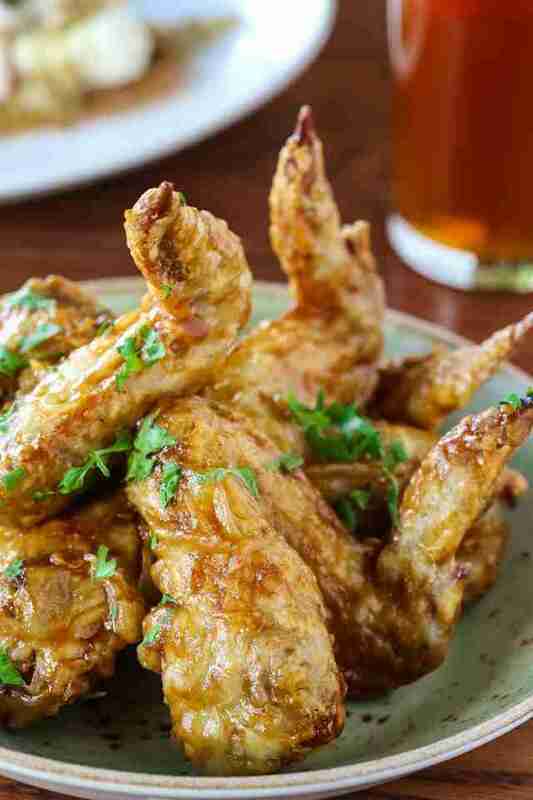 One of the featured dinner plates is the twice-fried chicken wings with honey, lemon, and smoked chilies. The bright and acidic coating boasts strong hints of orange, while the twice-fried method ensures an exceptionally crispy exterior, and juicy meat interior. While incredible seafood is certainly the specialty at Joe’s, don’t overlook their signature fried chicken. Available for lunch, dinner, and carry out, the heaping pile of fried pieces is worth digging into. No sides, no problem. Go straight for the hot and non-greasy pieces as an appetizer or pairing for those delicious crab claws or seafood salad, because life is all about balance. Food is far from an afterthought at this Lakeview brewpub. 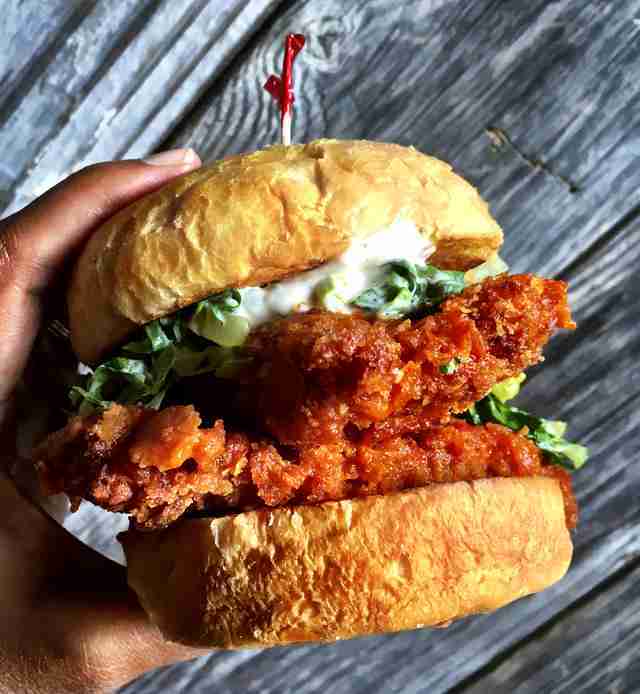 DryHop’s menu is inspired by their craft beers and includes a juicy buttermilk fried chicken sandwich. The thick chicken breast is topped with white cheddar pimento cheese, sweet pickles, and slaw, sandwiched between a soft bun. Each bite packs a punch of balanced flavors. You can also enjoy this sandwich during late-night hours, often a necessity after a few pints of their Shark Meets Hipster Wheat IPA. 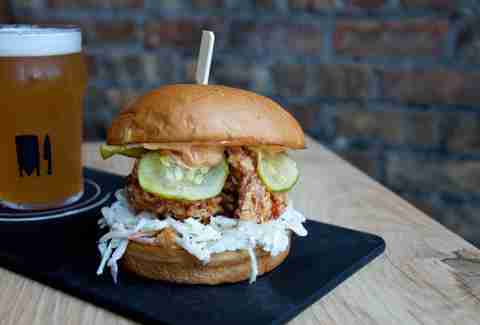 While Au Cheval undoubtedly produces one of Chicago’s favorite burgers, their fried chicken is worth making extra stomach space. 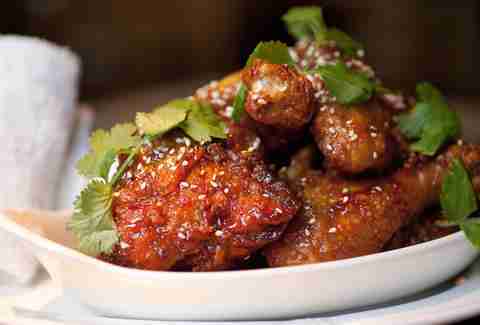 General Jane’s honey-fried chicken is their take on a General Tso's style with several large pieces of juicy chicken coated in a sweet and spicy red chili and honey sauce. Each bite has a delicate balance of heat and sweet, while the cilantro on top helps temper the intensity from strings of red chili studded throughout. This Andersonville spot is known for double- and triple-decker burgers dripping with toppings, but another dish worthy of your tastebuds is their half-fried chicken. The lightly fried pieces are served with a hefty helping of mashed potatoes topped with bacon gravy, because everything’s better with bacon gravy. Seven Lions offers a Southern fried chicken sandwich for lunch and brunch. The hefty portion of chicken is topped with buttermilk dressing, lettuce, and sweet pickles squeezed between a biscuit bun. Yes, a biscuit bun. If you’re feeling bold, add a kick with a dollop of their house-made Buffalo sauce. 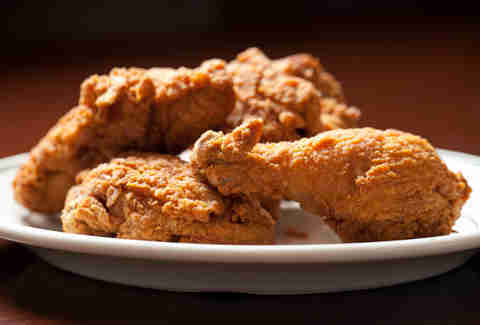 Fried chicken for an appetizer? Why not. 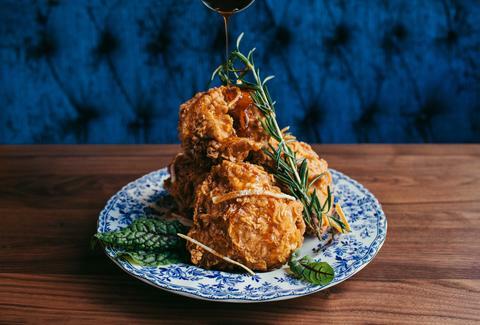 Prime & Provisions is a steakhouse at heart, but their fried chicken dish makes for a worthy start to your meal. Each thick and juicy piece is extra crunchy and served with a chili-infused bourbon-barrel-aged maple syrup for dipping or drizzling on top. Not ready to commit to a full plate? You can also order a half portion. Although you may regret it later. 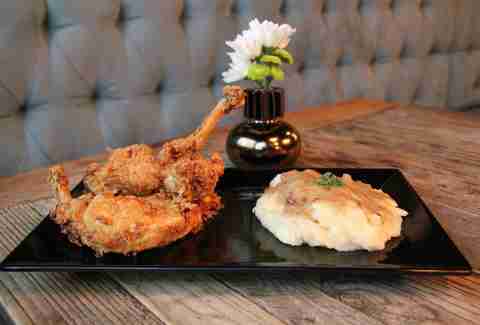 MAD Social offers a new take on fried chicken and waffles, replacing standard waffle batter with churro batter. 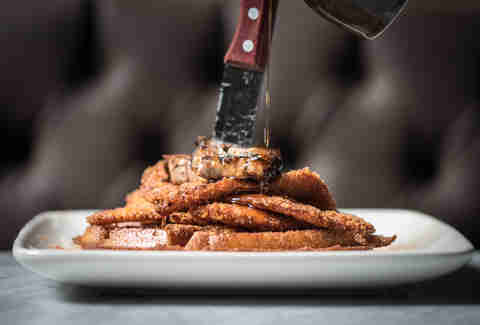 The pressed churro waffle is topped with thin and crisp chicken breast milanese, a layer of thick pork belly, and house hot sauce and maple syrup for your drizzling pleasure. It’s a little sweet and a little spicy and why didn’t someone think of this combo sooner?